3-4 lbs of organic grass-fed beef bones (knuckles and cut bones with marrow) or organic chicken carcass or fish carcass. Include chicken feet, fish heads, and scraps. Add bones, water, vinegar and vegetables to a stock pot or crock pot. Bring to a boil then simmer or turn crock pot on “High”. Simmer for at least 12 hours, ideally 72 hours, stirring periodically. Remove any foam or scum that rises to the surface. 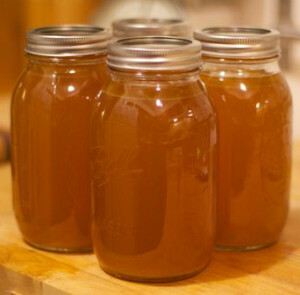 When complete, pour liquid through strainer into jars for refrigeration or use immediately.